Hepplewhite by Reed & Barton Sterling Silver Fish Knife Flat All Sterling 8"
Century by Tiffany & Co. Sterling Silver Cream Soup Spoon 6 3/4"
Royal Danish by International Sterling Silver Grapefruit Spoon Original 6"
Copenhagen by Manchester Sterling Silver Salad Fork 6 1/4"
Medici New by Gorham Sterling Silver Steak Knife HHWS Custom Made 8 1/2"
Vision by International Sterling Silver Cake Ice Cream Spork Custom Made 5 3/4"
Hampton by Tiffany & Co. Sterling Silver Cake Ice Cream Spork Custom Made 5 3/4"
Each item is fully hallmarked with Christofle hallmarks : CHRISTOFLE and O.C. "MARLY " TEA / COFFEE SPOONS. French Silver-maker Christofle is an enduring symbol of luxury. See my other ads, many other silverplate sets ! French Silver-maker Christofle is an enduring symbol of luxury, elegance and prestige in the art of silver. Each item is fully hallmarked with Christofle hallmarks. See my other ads, many other silverplate sets ! Rare Set of Christofle Art Deco Silver Plate Chevron Pattern Fish Knife & Fork . Shipped with USPS Priority Mail. Here we have a set of 12 cristofle of France fish fork and knife. The knives measure approximately 8 and 3/4 in Long while the forks measure approximately 7 and 3/4 inches long The knives and forks are in extraordinary condition. Probably date to the 1930s. A wonderful addition to any christofle chevron pattern flatware set. Please ask any and all questions prior to using the buy it now or making a best offer. We are very serious about selling so offers are welcome. MONEY BACK GUARANTEE FOR ANY REASON! Vintage Sterling Silver Irish Clover Souvenir Pin Hallmarked. Shipped with USPS First Class Package. EDWARDIAN ERA MADE SPOON IN OR AROUND 1901. 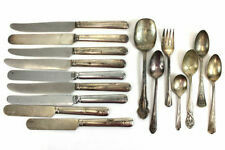 In an other ad, now or later, other Christofle s ets See my other ads, many other silverplate sets ! snails forks, ices spoons, serving sets, butter knives, potatoes spoon, etc. condition and age of this item. BIRKS York Regency Silver Plate Salad/Desert Forks 5 3/4"
" SPATOURS ". Hallmarks : Christofle & cavalier chess OC ( orfèvre Christofle). CHRISTOFLE CHICKEN / TURKEY SERVERS. Forks 11 1/8 " ( 28,5 cms ) &Knife 12 6/8" ( 32,5 cms ). condition and age of this item. S. KIRK & SON CO. STERLING SILVER Salad serving set-9.5" long fork and spoon. REPOUSSE. Marked S Kirk & Son CO. 925/1000. Fork #401. Spoon #508. Mono on back of handle in old script FDC (Frances Daniel Cary). No damage. Shipped with USPS First Class Package with insurance.. U.S shipping ONLY. Questions?? Please ask B4U bid. CHRISTOFLE DAX. Christofle France Hallmark. This set is antique, bought many years ago. ( dessert knives, fish set, etc ). 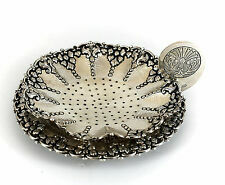 See my other ads, many other silverplate sets ! RARE 12 dinner spoons : 6 6/8 " ( 17,5 cm ). Pattern: flirtation. We have more pieces of Oneida Flirtation flatware, please check out our Ebay store! Oval Place / Soup Spoon 6 3/4" This spoon is in very good used condition! French Silver-maker Christofle is an enduring symbol of luxury. 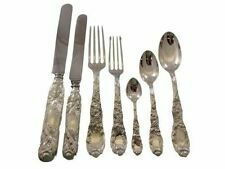 International Deep Silver EMPRESS Silver Plated Flatware Set Service for 16. Minimal usage marks but certainly nothing distracting. This set is way above average condition and has seen very little use over the years. 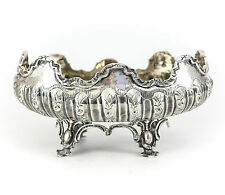 U.S. CAPITOL, WASHINGTON, D.C., PICTURED IN THE BOWL.WHITE HOUSE, MT VERNON, WASHINGTON'S TOMB, ON THE HANDLE, STERLING SILVER SOUVENIR SPOON, MARKED STERLING, 5 3/8" LONG, MADE BY CODDING, BROS. & HEILBORN, CO.
Set of6 Christofle POMPADOUR. See my other ads, many other silverplate sets ! Table fork and spoons 20,5 cms / Table knike 24,5 cms. tea spoon : 13,5 cms / dessert knife : 19,5 cms / dessert fork : 17 cms. Christofle RUBANS SilverplatedSoup ladle. NEW - I opened the plastic of the ladle to clean it - See pictures ! snails forks, ices spoons, serving sets, butter knives, potatoes spoon, oyster forks, etc. CASSVILLE, ENGRAVED IN THE BOWL, WISCONSIN, STATE SEAL ON THE HANDLE. STERLING SILVER SOUVENIR SPOON, MADE BY WATSON & NEWELL CO, 5" LONG MARKED STERLING. Up for auction is a gorgeous set of 6 Tiffany & Co. Saratoga Sterling Silver 8 inch dinner forks. They are 8 Inches long and have no Initial or initial removals. Gorgeous estate condition, no buffing. Date marker is "m". Together they weights about 16 ounces, or about 2.7 ounces each Enjoy. This is a part of a 50 year life long souvenir spoon collection totaling in the thousands of sterling souvenir spoons. For sale is a sterling silver souvenir spoon. Use pictures for condition. ANTIQUE J.A. HENCKELS/ ZWILLING FLATWARE SET. KNIVES ARE MARKED AS PICTURED. FLATWARE MARKED WITH "90"/ 8 WITH A HALLMARK. SET BELIEVED TO BE FROM THE 1930'S. SET INCLUDES (6) HOR D'OEUVRE FORKS 5 5/8". In the bowl it has engraved writing AUBURN, CAL. New ListingSorensen Sterling Silver Nursery Rhyme/Fairy Tale Spoon "Princess and the Pea"
The Princess and the Pea is a Hans Christian Andersen fairy tale. The back of the spoon is plain except for the silver mark and the maker's mark. There is no monogram or other engraving. I do have several other spoons with different HCA tales, feel free to ask. 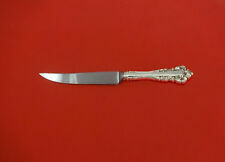 The fork is marked on the back of the handle with the Frank W. Smith hallmark, sterling, PAT. The fork is in good antique estate condition; NO DENTS OR REPAIRS. Silver Plate Serving Spoon. Silver Plate over brass. The spoon with the V has a label: ww11 Victory spoon. Huge lot of 89 pieces of Silver Plate flatware. 6 Baby spoon, one has a label 1832-1907. 6 Sugar spoons. The Spoon is in excellent condition with minor scratches due to normal use. No Monogram. New ListingVirginia Sterling Silver Souvenir Spoon 3.5"
State of Virginia Sterling Silver souvenir spoon. You can see the Sterling mark on photo 4. VG Condition. Silverplate by Oneida Community. Pattern: Royal Grandeur. Very pretty, and in very good condition with normal wear for the age. 16 pieces/ Service for 4. 4 Dinner Forks. ABERDEEN SOUTH DAKOTA STERLING SOUVENIR SPOON. NICE CONDITION WITH LIGHT EVEN PATIN A THERE ARE NICELY DETAILED IMAGES OF BRONCO BUSTER, INDIAN CHIEF, ARROWS AND HUNTING RIFLES. STERLING AND MAKERS MARK SHOWN IN LAST PHOTO. Up for offers is a beautiful set of 6 Old Hallmarked Soup / Place Spoons in the S Kirk & Son Co Repousse Pattern. The Spoons each measure 7 1/4 inches long and the total weight is 10.1 ounces troy. As you can see by the pictures the Spoons are in excellent used condition. The pieces are monogramed GS CB and large L in between. Please see the pictures for the exact 6 Soup / Place Spoons you are making offers on. (Excuse the camera reflections). If you need more pictures or have any questions please don't hesitate to ask. This item will be carefully packaged upon shipment to prevent damage. 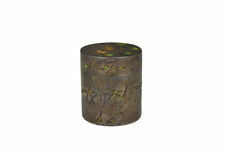 Shipping is free anywhere in the US and will come with a tracking number. If you need a shipping quote to Canada just ask. Thanks for looking and good luck. What Should Collectors Consider When Purchasing Silver Antiques? Choosing the right piece for a collection involves researching its background, such as its origin and current value, determining its authenticity, and assessing any damage. Collectors may also want to look for a monogram, as monograms can increase the value of a silver antique, depending upon its historical significance. How Do You Properly Care for Silver Antiques? Silver antiques develop a desirable patina over time, particularly if they are frequently washed and polished a few times each year. This occurs when silver begins to turn a light golden colour. Avoid using bleach or soaking the piece overnight, and keep silver antiques away from other metals to prevent adverse reactions. Also, when cleaning silver antiques, use soft sponges and mild cleaners, as harsh chemicals and steel wool can scratch silver. Fine silver has a purity of .999, which makes it one of the purest forms of silver. Sterling silver is one of the most popular choices, with a .925 purity rating, and it often possesses a greater luster and colour. Coin silver, which has a .900 purity rating, was used to make coins at one time but now appears in a wide range of other silver collectibles. There are also silver alloys that have a purity ranging between .800 and .899, making them more tarnish-resistant than other forms of silver. Silver plate is another type of silver with a lesser degree of purity. 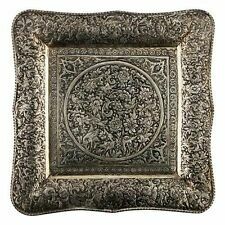 Silver plated antiques are constructed of a base metal and then coated in a thin outer layer of silver.